Activate this card at the start of your Main Phase 1, if you control no monsters. If any player Normal Summons/Sets a monster, that player cannot Special Summon that turn. If any player Special Summons a monster, that player cannot Normal Summon/Set that turn. Lol to any continuous spell floodgate. And I mean that. This game has so much removal, it’s ridiculous. And that’s not counting cards specifically meant to pop spells and traps. Quiet Life would have been far better as a one-turn quick-play or even a trap. This thing is slow, a minus, and limits your own plays, thereby assuring it could only be an option in random side decks. Stay away from this card. It’s a sloth in a world of Lamborghinis. These two are enjoying what seems to be what todays card is named: Quiet Life. Rigid activation rules and restrictions: gotta play this in the Main Phase 1, and only if you don’t have a monster. If you Normal Summon or Set, no Special Summons, and vice versa. Most decks do both, but some do more than others. This is a legit Side Deck option against some decks. If you Special Summon a lot, then you could side this against something that needs its Normal Summons/Set like Gladiator Beasts. It is strictly a side deck card though I think. You don’t want to be faced with a dead card because your opponent does almost all Special Summoning. Well here’s a Side Deck card if there ever was one. Quiet Life is a Continuous Spell Card with no cost but heavy restrictions. At the start of Main Phase 1, you have to control no monsters and then if either player does any Normal Summons/Sets, they can’t Special Summon. If either player Special Summons, they can’t Normal Summon/Set. This destroys certain decks and is probably going to be a hindrance to your own Deck. At the very least, Quiet Life will be a huge target for destruction/removal effects, and with no cost, that’s good enough for average. My personal #9 card of this set is the #8 card for Circuit Break, and it is a really interesting floodgate, Quiet Life. You can only activate Quiet Life at the start of the Main Phase 1 while you control no monsters, so this must be used immediately or when you are out of cards, but by then this card wouldn’t likely be necessary. Quiet Life simply prevents a player from Normal Summoning in the turn that they Special Summoned first or prevent a player from Special Summoning if they Normal Summoned first. This is useful in decks like Yosenju or Barrier Statues, who only Normal Summon, or possibly some Pendulum Decks, who for the most part only Special Summon. The card isn’t for every deck, but it is cool for decks that can make good use of it. Today we’re taking a look at Quiet Life, a continuous spell from Circuit Break and the #8 card in our top ten. You can only activate Quiet life at the start of Main Phase 1 while you have no monsters, and it comes with quite a game slowing effect. If a player normal summons, they can’t special summon that turn and vice-versa. Whilst it’s a continuous spell, as long as it remains on the field, it brings the game to a crashing halt compared to the usual pace. 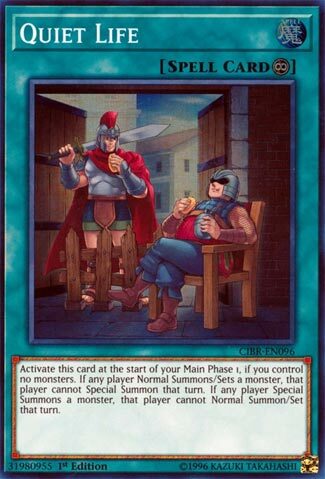 It’s a card the game has needed for a LONG time honestly, but sadly with removal options at an all time high, it won’t stick around for long.